Looking good. liking the look of that superstructure. Do you have any progress to report on your brilliant looking model ? Finished the tower structure and the basic funnels. The compound curve on the sides of the tower was 2 layers of 0.8mm ply and the radiused corners were balsa strips. Filled, sanded and primed several times. The funnels are not fixed yet as there lots of fiddly bits and painting to go between them. A couple of weeks more filling and sanding later. I've smoothed out the curves and cut the window holes. The windows sit out about 100mm on the real thing so the glazing and frame will go on top of these outlines. Sprayed the base colour (International/Buff) and couldn't resist adding the red to see how it looked. Very traditional colours. The colours are an exact match to samples from the owner but the buff seemed very dark until I realised that all of my reference photos are in bright sunshine and from a distance. Now that the base colour is down I can start adding a few details – pipes, air conditioning vents, etc. and then paint the decks. Still quite a bit of work to do on the funnel stacks so they don't get attached yet. Starting to all take shape now. There is still the bridge/wheelhouse to add onto the tower but you can get an idea of the size of the thing. It's pretty light and has a high centre of gravity, those big rudder should make it turn quite sharply. With that big area of superstructure acting like a sail it looks like it will be pretty unstable – hopefully the ballast will keep it steady. Now it's back to work on the hull decks for the aft bulkhead, vents and bollards – the fiddly bits. There are 44 guests reading this at the moment. Why not join the forum. It's for beginners right up to some of the best modellers around but basically for anyone who enjoys making model tugs. It's free and full of great builds, photos and some of the members now everything there is to know about tugs and models. And they're friendly and helpful as well. I've picked up heaps of tips and advice from some the builds. She is looking real good Sea monkey. You must have been filling and sanding for an age--but well worth it. husky looking tug you built. like the color scheme sea monkey. 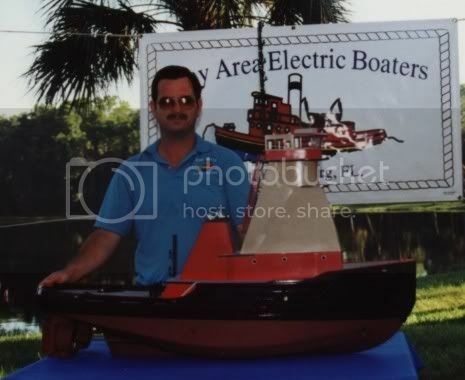 Does any one have a link and a contact at the link to see if I may also be able to get a set of the plans needed to build a model of this tug as well. I built an ATB useing a Mr. Darby tug and now want to build one of the actual ATB's. Well today I got a reply back from Chris and I will be getting my set of plans for the tug and the barge as well. I can't wait to get this project started after I get a couple of others done first. The other two projects are Naval models of large size in 1/96 scale. The models are that of a modern carrier and an Iowa class BB as they were during the Gulf War. It's supposed to be summer here but we are having the worst summer on record, Too windy to sail, too much rain to paint and temperatures half what they should be so the boat took a back seat while I jammed holidays, house maintenance and family into whatever half good days we had. Now I'm back at work and back on the project again in the evenings 1-2 times a week. The basic superstructure is complete and I've added the hand rails and the airconditioning ducts and drain piping. I enjoy soldering the rails – just these (port, starboard and fire deck took a night to make, another to fit and painting over 2 more. These photos are before painting. Slow progress. The white doors at the lower rear are covers for the engine room air intakes. There are louvres behind them but in all of my research photos I've never seen them open. Also finished the aft deck bulkhead and deck supports. These slide in under the overhanging main deck. The 3 holes along the top of the bulkhead are for the deck lights. This is where I came unstuck. I had planned to put in all of the deck lighting using 1.5mm/1.5v bulbs and 1.8 LEDs for the floodlights. All the lighting needed to be installed before I could assemble all of the superstructure. I made all of the lights – 14 deck lights and 6 floodlights for each boat. It was a nightmare wiring in the 1.5v lamps, they are tiny and very fragile. They are also quite dim but work better at just over 2v. At the last minute I realised that changing bulbs would be virtually impossible so I set up a couple of lamps for a longevity test. They don't handle variations in voltage too well and only last about 6-10 hours. 3v lamps are too big to work in scale so it was plan B. No deck lights, floods only. That was about 3 evenings work and back to square 1. Thats is coming along very nicely Steve Its a shame you will not be able to have deck lights Are you sure there are no alternatives you could use ?